Do you ever dream that you are in school and didn’t do your homework? I have this recurring dream where I find myself in high school with no idea of how to do the math assignments, so I don’t even try. This is not based on anything that ever happened in real life. I generally got my homework done, even if I rushed through it sometimes. As for math, although I wasn’t the top student, I did reasonably well. I’m guessing that the dream could reflect a general fear of finding myself in situations where I am clueless—unable to “do the math” not literally, but in the sense of figuring out how things fit together. As far as I know, there haven’t been any specific problems triggering this dream. Readers, any suggestions? For those who like math puzzles, I’ve posted one here. 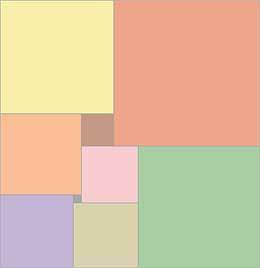 There are nine squares, all of different sizes, within the rectangle shown below. The smallest square measures 1 along each side. How long are the sides of all the other squares? My husband, who is an engineer, sent this to me in an email from work about a decade ago. I solved it pretty quickly, with one variable. Meanwhile, the engineers were devising convoluted solutions with multiple variables—which goes to show, there are times when simpler can be better. With that hint, I leave you to have fun with the puzzle!